Books and Needlepoint: Guest post by Terry Spear - and a Giveaway! Guest post by Terry Spear - and a Giveaway! I am very honored and excited to have Terry Spear as my guest blogger today. 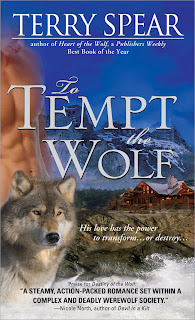 She is the author of To Tempt the Wolf which is currently on a virtual tour. So, without further ado - let's hear it for Terry! Wolves (and Werewolves) Get Such a Bad Rap! Thanks so much, Kristi, for having me on your blog today! I’m a big needlework fan also, and make award-winning teddy bears that have hand-embroidered paws with names and birthdays for special occasions! I’ve even tossed around the idea of creating a wolf bear…uhm, bear in wolf’s skin? Which brings me to my real purpose here—talking all about wolves—well, werewolves, too. Wolves really get a bad rap. You don’t hear about the big bad bear. Or the big bad cougar. Yet they attack people and kill them much more frequently than wolves do. But what about the big bad wolf? Think of The Three Little Bears. None of the bears are really bad. None of them wants to eat Goldilocks. And I don’t remember ANY cougar children’s story where the cougar wants the children for dinner. The Three Little Pigs? Red Riding Hood? There’s the big bad wolf all over again. You don’t see shapeshifter killing machines that are bear shifters or cougar shifters, but here comes the werewolf. The perfect horror story. Man turns into a wolf-like monster, can’t remember his human side of his nature, and kills anyone and everyone. Sure, you see the human side of him…the fact he so desperately fights becoming the beast, but in the end, the only way to cure him is to kill him and put him out of his misery. And so I write about the werewolves’ side of the story. Sure, you have some bad eggs. Just like you have evil humans. But the good guys make up for the bad. And contrary to popular belief, they do live among us. At least in my world, they do. They’re doctors and police officers and judges and artists. They have families, pay taxes, and enjoy many of life’s little pleasures just like we do. And they have troubles just like any family does. But of course, it goes beyond that because living among us, it can be difficult for them to keep their wolf nature secret. Also, their family unit extends to a pack, and they take care of their own. And they don’t believe in divorce. Mating is for life. Just as it is for real wolves. Plus, just as it is for real wolves, the werewolves are extremely fond of their offspring. The whole pack family is! They all play with them, feed them, and protect them. They’re the future of the pack. So if you’re looking to see the true story about werewolves, come check out my world! The men are hunks, the women are spunky enough to be their match, and the stories will show you what wolves are like—the real story. Danielle from Sourcebooks has kindly given you, my readers, a chance to win not just To Tempt the Wolf - but also Heart of the Wolf. That's right - 2 books, 1 winner. You must live in the U.S./Canada though with no PO boxes. Just answer Terry's questions above with your email address to be entered. If you would like more entries, I would love to learn more about Terry - so just visit one of the links above and come back and tell me something you have learned! This giveaway will end on Sept 30. Would i give a werefolf a chance, really not sure, can't honestly answer either way. If I met a hunky werewolf I would definitely give him a chance! One thing I learned is that Terry has five book releases planned for 2010. If I met a hunky werewolf, I would give him a chance.Everything is not all looks though,we'd have to hit it off too. Woohoo, ladies! You all beat me this morning! Virginia, all great points, and I'd be tempted too!!! The SciFi guy is so sweet!!! I'm honored to be on his site! Kira, good for you!! I thought I was doing final line edits constantly, but with nothing to show for it! But yep, 5 releases next year! woohoo, thanks so much, Crystal!! When asked if I would give a werewolf a chance, I instantly thought no. As I sit and ponder it, I think I might. The feral instinct is attractive, and as long as I was safe from harm, why not?! So yes, now I believe I would. Terry - the bears are adorable! I am pretty sure that my older girls would like these as well - I am thinking that upon my older ones graduation in the spring it might be neat to get her one with the date! I am definitely going to be book marking that page. Don't be surprised if you hear from me! I certainly would - not for nothing do I love "Beauty and the Beast"! No way, man - I'd run and hide - OMG are you kidding me - I'm not that courageous! But I'd love to read her books. Did you know that Terry teachs writing workshops to teens? Hi! Just posted this guest post and contest on Win A Book. No need to enter me. I would love a chance at winning these books - thanks so much for the giveaway. No - no werewolves for me. But a real wolf? Such beautiful creatures. And so misunderstood my so many people. They are being killed in huge numbers, and for the most part, for no reason at all! Teabird, I loved the tale of beauty and the beast! Woohoo, thanks, Sheila!!! I love dogs too. They truly are almost human. When we bopped our Afghan on the nose with a ball by accident, she went into the bushes and sulked. :) No matter how much we coaxed her, she wouldn't come out. I am fascinated to read about wolves and even to watch them in a movie, but give one a chance, unequivocably, never. I learned that Terry has written Young adult books. No, I don't think I'd give him a chance! I would definitely give him a chance. Actually can I have one now? Great post. I have been wanting to start the wolf series for a while but havent had the chance. The Vampire...In My Dreams was great I read that last year. Ever think of turning that into a series as well? I found out in addition to the adorable bears (Vampire Bear, how cute) and The Vampire...In My Dreams, she has written another YA book called Deidre's Secret about a girl who has premonitions of danger. Sound interesting too. If I met a warewolf I would give him a chance. It wouldnt be because he was a warewolf, I would have to factor in other aspects as well. I'd have to see a picture first. Some of them are kinda cute but I don't do blind dates. I would like to think that I would definitely give a werewolf a chance. I've always been fasinated by wolves, from Kipling's "The Jungle book" and the story of the man cub raised by wolves to Due South's half wolf/half dog crime fighting partner, I've always thought of them as fierce but friendly. I loved Jungle Book also, Ensee! I had a nice note from a fan that said she wasn't about to read a story about a man who shapeshifts into a wolf, but when she got it free at conference, she finally decided to read it and fell in love with the characters. She couldn't put it down. A friend of mine writes about seal shifters and I couldn't imagine how that could appeal. But the stories are really good. I really like to read about werewolves, but I would be too scared to give one a chance! I'd give a hunky werewolf a chance. I learned that in Terry's family there was political intrigue, ties to royalty, romance, and tragedy that inspires her to write medieval stories set in England and Scotland. Lucky lady! Thanks for dropping by and commenting, Marie and Beth!! I will be in Toronto tomorrow, giving a Happy Hookers class to romance writers on Saturday. I'll try to drop in if I can on Friday from the hotel, but if I'm unable to, I wish everyone well, have a terrific weekend, and good luck with the contest! It would probably depend on how I was approached. If I met him as a human first and then found out about his shifting tendencies, then I probably would accept him. Just having an wolf walk up to not would probably not go so well!! I would totally give a werewolf a chance! Depends on how the hunky werewolf and I first met. First impressions are important. I learned at Terry's website that she is originally from California, lived in eight states and now resides in the heart of Texas. I also loved her Celtic Clan Bear, Campbell. He was so cute. Lisa, I'm sure I'd feel the same way! Human first,...then, well, we'd have to see. Bridget, that's the spirt!!! Sounds like the perfect heroine, full of adventure! Thanks, everyone! I'm in Toronto, stopping in before I teach Happy Hookers to romance writers here! I really enjoyed the interview about the wolves and would LOVE to win the books. They would be something different for me to read. Yes, I would definately give a werewolf a chance! Beth and Beth, heroines after my own heart! Did you know that Terry Spear works in a library? I think that would be a fun job. "The series is based on humans who shapeshift into wolves—real wolves from every standpoint, except, they have human thought processes, although their wolf instincts are ever present and can cause trouble on occasion." Thanks for commenting, Gaby! Working at the library can be fun. We have some real interesting cases, should be in a story! :) We have a pretend cat that meows for our library patrons, but someone offered to give us a real one so we could interact better with patrons. Litter boxes, squealing cat when kids grabbed it's tail or stepped on it...hmmm...I do love going to the vet's office where they have a couple of lazy cats sleeping on the counter though! Or the garden shops where they have them roaming the grounds. :) Still need to include one in Book 6 that I'm currently writing because the newly turned werewolf owned a cat prior to the change!! Have a super day, and thanks for dropping by here and the other places! Of course I would give your werewolf a change. I would love to win these books. Hi Budletsmom, that's super! Good luck! I learned that Terry Spear has five books planned for release next year! Sure I'd give him a chance. I love werewolves!! Thanks for this giveaway and please count me in. I am old and pretty set in my ways - not sure I could keep up with a werewolf! Would love to win the books though! Woohoo, good for you, Etriv and Lee. Karol, we're never too old to give something new a try!!! :) One of my distant relatives was roofing her house in Canada at 87. Now that's the spirit!!!! Please include me in this great giveaway! And, thank you for introducing us to this interesting and talented author! If I was not married (to same man for 38 years) and if I was a little bit younger and could still romp through the woods, I would give a hunky werewolf a chance! I learned some neat things about this author from her website. She gives online writing workshops! She lives in Texas! (my favorite state to live too!) And, she makes some adorable bears. I will must read these books Thanks. i was searching for colon blow coupon to get great saving. A Highlander's Temptation Blog Tour! Code Blue! Win Beat the Reaper! 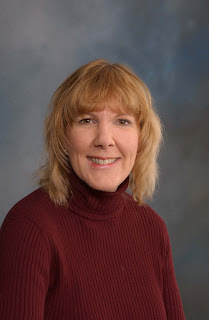 Laced With Magic's Barbara Bretton Posts Today! Guest Blog by Loucinda McGary - and a Giveaway! A is for Another Great Giveaway from Hachette! Detectives Don't Wear Seatbelts - Giveaway! Sourcebooks Heyer Promotion and Giveaway! Thank the Lord, School's in Session! The Gift of an Ordinary Day - Giveaway!